Live like a Londoner and share a postcode with the Queen! This spectacular family house, a classic London townhouse built in 1846 and quietly situated in a friendly and beautiful London terrace 10 minutes' WALK from Buckingham Palace, boasts 7 bedrooms, a sitting room, a kitchen-dining room (seats 12), a conservatory-study, 3 bathrooms + 2 separate WCs & free unlimited wi-fi throughout. With the rooms laid out on four main floors (and some mezzanines), the house works well for extended families. There are 4 x large double beds (150cm, 5'6' wide), 1 x smaller double bed (135 cm, 4"6" wide), 3 x single beds and 2 x fold-out bed-chairs. Maximum permitted occupancy is 12 people plus infants (2 x cots provided). The main rooms have ornate ceilings, marble fireplaces, chandeliers & working window-shutters yet the house is fitted with with every modern convenience: washing machine/dryer, microwave, dishwasher, hair-dryers, irons, SMART TVs in four rooms (with internet access, Netflix etc. ), gas-log open fire, digital radio/sound systems with iPad, iPhone/MP3 'docks', linen/towels, books, toys, DVDs, 2 x highchairs and other baby equipment. Cozy and warm in winter, high quality fans keeps the top floors comfortable in the very hottest summer (though mostly, this being London, they're not needed). Outside there’s a suntrap terrace leading from the kitchen, plus a delightful patio garden wreathed in jasmine and wisteria. A great sports centre with public-access gym and swimming pools is a two minute walk from the house, as are a wide range of grocery stores and other local shops, banks, a post-office, beauty salons and so on..
We keep the house in immaculate condition, constantly re-painting to remove scuff marks and renewing furniture and accessories regularly. Guests frequently comment on our level of cleanliness and attention to detail. A welcome pack of groceries greets you on arrival. We pride ourselves on the fact that the house is imaginatively decorated and laid out in such a way that there are great opportunities for privacy, as well as for all members of the household to meet together sociably. The location of this wonderful house is unbeatable. Although it is situated in the very heart of London, it is quietly positioned. The area is very safe and well served in every possible way. The neighbouring streets are full of great local shops (including supermarkets - open all hours - and specialist delicatessans), cafes and restaurants. At one end of the street is a local food market; at the other, under two minutes' walk from the house, is Pimlico Underground ('Tube') Station and terrific local bus routes. From the house it is just a short stroll to Victoria Station, Tate Britain, the Thames, Buckingham Palace, Westminster Cathedral, St James’ Park, Battersea Park, Downing Street, the Houses of Parliament and Westminster Abbey. Several theatres, too, and a beautiful new cinema are within easy walking distance, and it is only a short tube/bus/taxi ride (or you can walk) to Hyde Park, Harrods, Harvey Nichols, Oxford Street, Piccadilly Circus, the West End, Trafalgar Square, Leicester Square, the National Gallery, the National Theatre, the National Film Theatre, the Festival Hall, Shakespeare’s Globe Theatre, the London Eye, the London Aquarium and other main London attractions. There are easy transport links to all London airports and mainline stations, and London and regional bus tours. For those who like to run or jog, there are great routes along the River Thames and through the historic local streets and parks. This spectacular house is brilliantly located for special annual London events, including - within WALKING distance - all Royal Family celebrations, the Chelsea Flower Show , the London Marathon (finishing line), the New Year's Day Parade, the Lord Mayor's Procession & Show, the Russian Winter Festival, outdoor skating ,the Chinese New Year celebrations, Trooping of the Colour, Royal Academy Summer Exhibition, the Thames Festival, the Chelsea Antiques Fair, the State Opening of Parliament, the London Film Festival, Guy Fawkes Night, the main New Year Celebrations, Christmas Lighting Celebrations and Westminster Abbey for Christmas Carols and all Royal Family celebrations. Within a short tube/bus ride you'll reach the London International Boat Show, the Olympia Fine Art & Antique Fair, Wimbledon, the Holiday and Travel Show, Party in the Park, the Proms at the Albert Hall, the Covent Garden Festival of Street Theatre, the Notting Hill Carnival - and many others major cultural and sporting events. Wimbledon is an easy tube-ride away, as is Wembley Stadium. english, french, german, All languages, using Google Translate. Brilliant! We are a couple who have worked mainly in the theatre and the arts, although Adrienne is now a writer/researcher specialising in fatherhood and Martin coaches in communications. We purchased our central London home in 1985 and lived there until 2002. The moment we opened the door we loved it. It felt then, and feels now, as if only happy things have happened here - which can't possibly be true, since it's almost 170 years since it was built! We wanted to live right in the heart of London, and you can't get much closer to the heart than this. We also wanted a spacious house, with high ceilings and a sense of generations upon generations of people living there before us. And that is exactly what we got! We raised our family here, working from home, so the house has always been busy and full of children. When we left it, and downshifted to another part of London, we rejoiced that we didn't have to sell it, and that other people could now enjoy it too. The remarkable thing about 'Pimlico' (the area in the London Borough of Westminster in which our house is), is that it is quite like a village, and yet it is right in the heart of perhaps the greatest city in the world. Neighbours know each other; our quiet street contains many family houses and has an active residents' association, the people in the shops are friendly, and yet it's cosmopolitan and fast-paced. In Pimlico you can be peaceful, yet never feel that life is passing you by. The bathrooms and cloakrooms are beautifully fitted. Almost all have outside windows. All are newly tiled and maintained, with high quality fittings The showers are powerful (many of our guests have praised them!) and there is plenty of hot water. The top floor bathroom has roof lights as well as a window, so you can lie back at look at the stars! There is a WC on every floor, or on the half-landing, so easy access for all guests. Central heating throughout, underfloor heating in lower ground floor bathroom. A very warm and cozy house! Washing machine in lower ground floor utility area. Washing machine tablets provided. Gas log fire - terrific. You'd think it was 'real'. In main sitting room. Fireplaces in many other rooms, though not with working fires in them! Pay-garages nearby. We can send details. Plenty of towels, face cloths, cotton wool balls, cotton buds . . . The gracious living room on the first floor has a large TV, floor-ceiling period windows and working 'shutters' and seats 10 round the open fire. Plenty - all bone china, some decorative, others plain. Delightful! Hand-built, painted kitchen with French tiles as a splash back, double sink, dishwasher and all modern appliances. Table seats 10 or, when extended, 12. Front of house - just outside the glorious full-length windows in the main sitting room. Not as part of the house - but 5 minutes down the road in an excellent sports centre. This home is full of character and charm, and so conveniently located in central London. Many sights are within easy walking distance or just a short tube ride away. The owner left a terrific welcome basket, the home is well kept in a great neighborhood and made for a fantastic home base to explore London. Great base to explore the many sights of London. Fab location close to Underground. Perfect house for large family group. Would recommend it without hesitation. So pleased you would recommend - and that you were able to make the most of the location to explore London! You were lovely guests and would be welcomed back any time. Thankyou! We had 2 families with teenagers staying at the house. The house allowed us plenty of space. This house is in a great location as well. We enjoyed our stay here very much! Adrienne even assisted us in getting our tickets to the Arsenal match! You were very clever to get hold of the tickets! It was my pleasure to keep them safe until you arrived. We're so pleased you enjoyed your time in the house - and the match! The house is fabulous and in a lovely, central area. Great house. Great location. Great communication. Very close to the tube and in the heart of London. The hosts were very communicative. The property and furnishings were spot on as communicated. Fantastic stay that allowed our extended family to reconnect. So much better then a hotel. The family room and the dining area allowed us to gather in the morning and in the evening. Very clean and Adrienne and her team were very responsive to our questions both before and during our stay. The house itself is centrally located and the access to public transportation is terrific. The surrounding Pimlico area was also very convenient with many useful stores. We all very much enjoyed the library and the assorted collection of books. Finally, my nieces and nephews (all in their 20s) will have many happy memories in the coming years of their visit to this incredible house. Thank you for staying with us - and being such lovely guests. We are always especially thrilled when extended families reconnect in our lovely house! With its amazing CENTRAL Zone 1 London location (SW1V2ND - Google it! ), this quietly situated family house is brilliantly positioned for a see-all London visit. 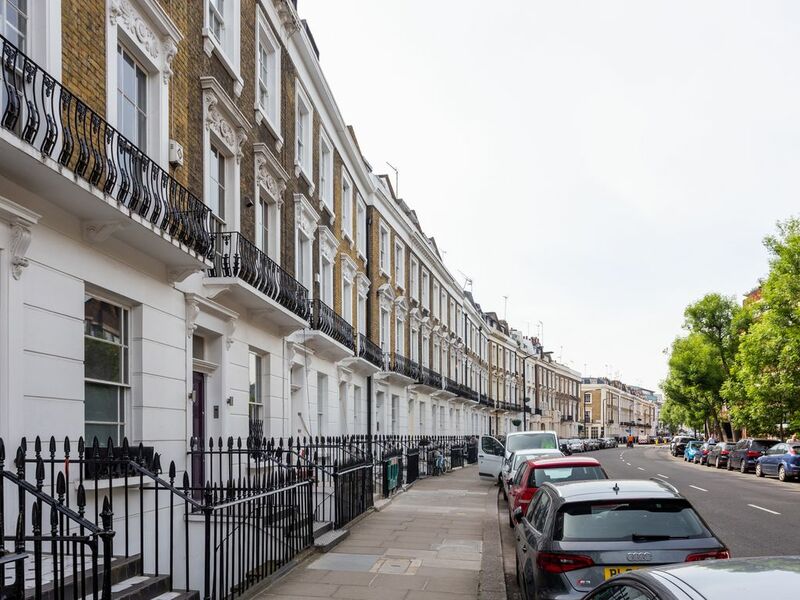 It’s a minute's WALK from shops, supermarkets, restaurants, outdoor food-market, Pimlico Tube (underground) & 24-hour taxis, buses, car clubs, bike hire. It’s a 10-min WALK to the River Thames, Buckingham Palace, Tate Britain, Lambeth Palace, Westminster Cathedral, theatres, cinema, St James Park, Victoria Station & Victoria Coach Station (from which there are easy rail/coach links to Heathrow, Gatwick & Europe). It’s a 20-min WALK to Westminster Abbey, Big Ben, the Houses of Parliament, the London Eye, the King's Road/Chelsea. Short tube/bus rides take you direct to Harrods, the major Museums, Oxford Street, Piccadilly Circus, the West End, Trafalgar Square, Covent Garden, the National Gallery, the Imperial War Museum, the Festival Hall, Shakespeare’s Globe, the National Theatre & National Film Theatre, Hayward Gallery, IMAX, Waterloo Station, Tate Modern. Local activities include: shopping, restaurants, historic monuments, art galleries, theatres, cinemas, river boats. VAT receipt available on request. To reserve dates, full non-refundable payment due if within six weeks of arrival date: 50% on booking, then 50% 45 days before arrival. Payment via UK Cheque, electronic bank transfer or credit cards via PayPal. Returnable security deposit of £250 taken on booking. Beds, except for the two (very comfortable) sofa chairs, made up. Rates are subject to change until reservation. Generally the property is let for 4 nights minimum stay but if there is a vacancy for a shorter stay between lets we will do our best to accommodate your requirements.